We LOVED Emma! We lucked out with such a great photographer. We really enjoyed our interaction early on with an engagement photo session, and the photos we got back were stunning; so, we knew things looked bright for the wedding. She and her assistant Mackenzie blew us away with their professionalism during the wedding! They had the perfect balance of letting events naturally flow while getting all the important shots we wanted. We can’t wait to see the final photographs, and the teasers online have been exciting to see. We highly recommend using Emma as your wedding photographer. If I could give Emma more than 5 stars I would ! I knew as soon as we got engaged I wanted Emma to be our photographer, her Instagram speaks for its self, every single photo is absolutely beautiful. Meeting with her made the decision even easier, she is professional and makes you feel so comfortable. I love all of our engagement photos and was blown away by how perfect our wedding photos are as well, not a moment went by that wasn’t captured in a photo! Brandon and I now have a for ever photographer & we can’t wait to work with Emma again. I really enjoyed having Emma as a photographer she is fun and personal while remaining very professional. The sneak peak pictures she has sent so far are more beautiful than I could have imagined. We also had a second shooter at our wedding who was sweet as well. Emma took care of everything I didn't have to worry about anything. Emma is such a pleasure to work with! I am stunned at the beauty of the photographs that she took during our wedding, she is worth every penny! In addition to her fantastic work, she was so helpful throughout the day. She did a great job of calming down my nerves and keeping us on schedule. I was really worried that the groomsmen would give her trouble, but she did a great job of keeping control of them; it was clear that she knew what she was doing! She made me so comfortable and I am so thankful that we used her to capture our wedding day. Emma was amazing and I'm so happy with the results! Her photos have a lovely, soft quality to them that I absolutely love, and she captured our wedding day perfectly. 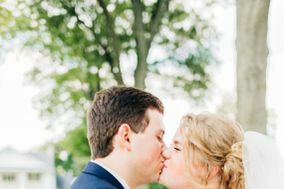 All of her pictures were gorgeous, but I was particularly impressed with those she took on the dance floor at our reception; it's not the easiest setting to shoot in, with low lighting and lots of movement, but the pictures Emma took were fantastic and include some of my favorites. On the day-of Emma was really helpful and cheerful, staying calm and offering suggestions when we had to alter our timeline slightly. I would absolutely recommend her to any bride. Emma is wonderful to work with! She is sweet and accommodating in every way possible. Her pictures speak for themselves. They are absolutely stunning and beautiful. With all the stresses on a wedding day, Emma's photography was not one of them! She truly makes you feel at ease. Thank you, Emma for photographing our engagement pictures and wedding day. I cannot wait to have you photograph our family in the future! Emma captured some fabulous photos of our wedding day. She was able to take a pair of awkward goobers and snap some of the most beautiful moments. My dad was diagnosed with cancer and unable to participate in everything that day, but the pictures I have of him/with him I will cherish the rest of my life. I can't believe Emma was willing to drive all the way to middle of nowhere just to capture our laid back wedding day. Emma captured our day in a beautiful way. She caught all of the small details that made it special to us. She was so easy to work with and made us feel comfortable taking photos, which isn't always easy! We love looking back at our truly gorgeous album that Emma created for us and are so happy we used her services at our wedding. Anyone who hires her will be extremely happy with their choice!